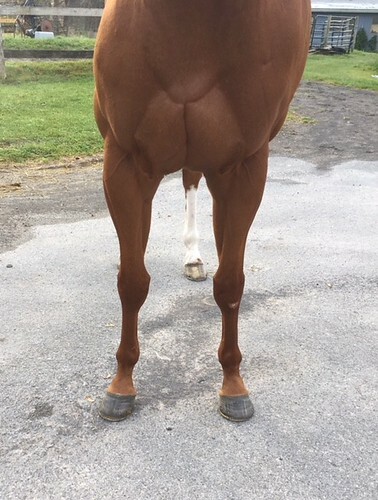 This impressive and solidly built young son of champion Curlin elicited admiring “oohs and aahs” from some shoppers who were accompanying us — “He’s so majestic!” they exclaimed, and we agree that is a perfect word to describe this gorgeous and regally bred horse. 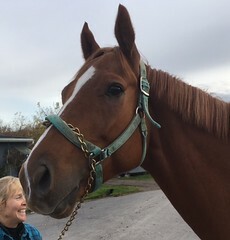 Bo Hopes did not inherit his sire’s racing ability, nor that of his stakes winning dam — but that is going to be the sport horse world’s gain. 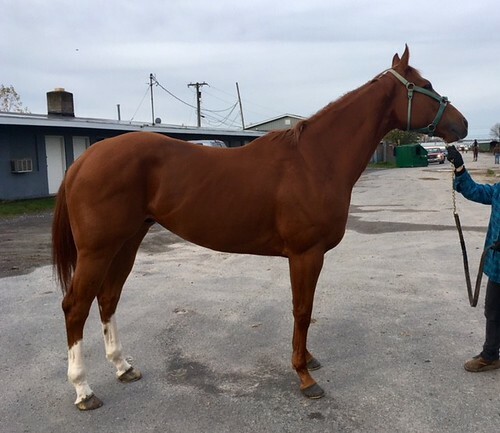 Bo broke his maiden last summer, but he is finding the NW2 conditions a bit above his head, so his owner/trainer wants to let him find a home that can channel his athletic talents in a new direction. With his strong bone, balanced build, sloping shoulder, flashy good looks, and very nice balanced movement with good suspension, we can see Bo excelling in eventing, dressage, or in the hunter ring. His trainer says he is playful, and can be a strong horse, so he needs an experienced rider. She says that he likes to work and comes back from working calm and happy. She says he is good in turn out with other horses, and is a very easy keeper. 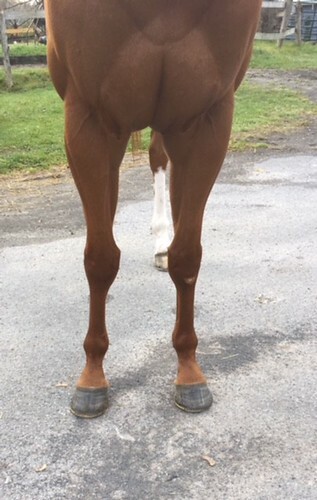 Bo is described as a very sound horse, although he has a cosmetic scar on one knee from an old cut he got as a youngster. We watched the video of his winning race to see more of his movement, and it verified the great impression Bo made when he jogged for us. 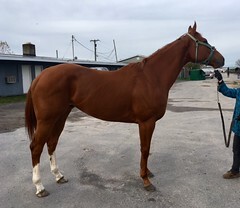 We saw a big strided fluid gallop, with good reach, and an impressive extended trot with flat kneed reach from the shoulders as he proudly came back to the winner’s circle. His pedigree is ideal for sport. 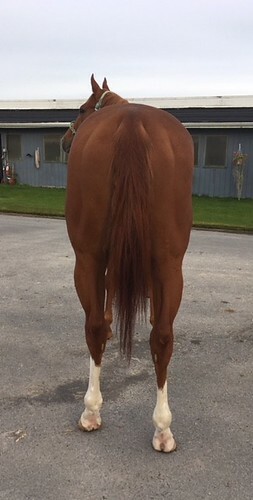 His sire Curlin is by Smart Strike out of a Deputy Minister mare. 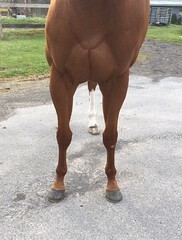 Bo’s dam is a stakes winner by Regal Classic, who is known for producing horses with great brains and jumping ability as well as good movement. Bo checks all the boxes for what everyone says they want — beautiful, sound, young, good bone, great movement. 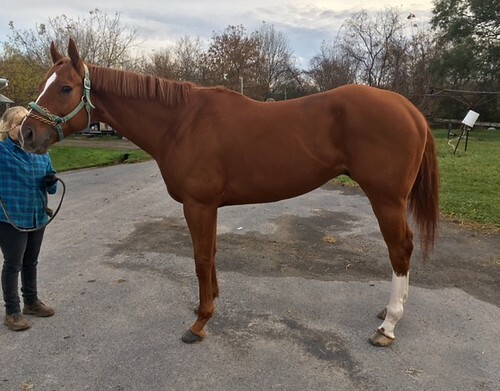 So don’t hesitate to call if you want to be the lucky one to bring this son of Curlin into your life!